Background & Objective: Since the release of ivacaftor-lumacaftor, several red-flags have been raised that highlight the clinical efficacy of this combination strategy that may be limited due to antagonistic drug-drug interactions. Method: The effect of ivacaftor, its major metabolites M1 and M6, lumacaftor and the novel cystic fibrosis transmembrane conductance regulator (CFTR) modulator tezacaftor at 10 g/mL on the enzymatic activity of the major xenobiotic metabolizing enzymes CYP1A2 and CYP3A4 as well as the minor enzymes CYP2B6 and CYP2C9 was assayed. Results: Lumacaftor (3.74 x 105 ± 3.11 x 104 RLU), and ivacaftor-M6 (3.43 x 105 ± 7.61 x 103 RLU) markedly induced the activity of CYP3A4. Ivacaftor (2.22 x 105 ± 3.94 x 104 RLU) showed a lower relative ratio of luminescence units compared to chloramphenicol (3.17 x 105 ± 1.55 x 104 RLU). Interestingly, ivacaftor-M1 (6.74 x 104 ± 3.09 x 104 RLU) and the novel CFTR modulator tezacaftor (2.40 x 104 ± 8.14 x 104 RLU) did not show CYP3A4 induction. In the CYP1A2 and CYP2C9 assay, all metabolites showed a decrease in the ratio of luminescence units compared to the controls. 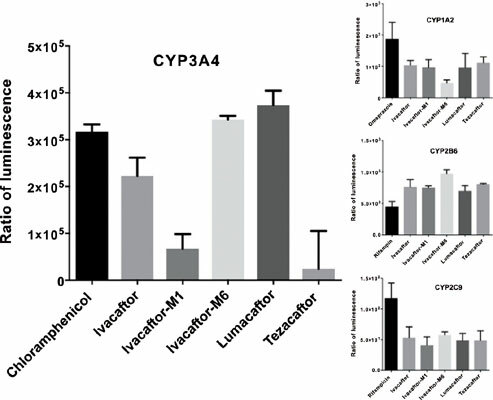 Ivacaftor, its major metabolites, lumacaftor and tezacaftor all showed a slight increase in the ratio of luminescence units compared to the control rifampin with CYP2B6. Conclusion: All in all, present findings would suggest that lumacaftor and ivacaftor-M6 are strong inducers of CYP3A4, potentially reducing ivacaftor concentrations; ivacaftor itself induces CYP3A4 to some extent. Keywords: Cystic fibrosis, ivacaftor, lumacaftor, CFTR modulator, cytochrome, drug interactions. Keywords:Cystic fibrosis, ivacaftor, lumacaftor, CFTR modulator, cytochrome, drug interactions. Abstract:Background & Objective: Since the release of ivacaftor-lumacaftor, several red-flags have been raised that highlight the clinical efficacy of this combination strategy that may be limited due to antagonistic drug-drug interactions.